The book includes six chapters, partitioned symmetrically by an intermezzo, with its core in the third and fourth chapters. The first chapter maps the cultural context and the author’s methodology. Its temporal focus runs from 1810, with the introduction of the first organ at the Jacobstempel in Seesen, Westphalia, to 1938, when many synagogue organs were destroyed during Kristallnacht. Definitions of Jewish music – yet another unavoidable characteristic of studies in Western Jewish music – are presented briefly next to some new definitions of the field, such Hans Samuels’ first description of “Jewish organ music” (7). In chapter two, the author attempts to ground the Hebraic basis of the organ philologically by tracing the origin of the biblical ugav and the post-biblical magrefa, while offering commentary about important textual sources on the topic from the Renaissance. Frühauf also includes iconographic depictions of the organ in various contexts to demonstrate that “[t]he very early fascination with organs in Judaism was not at all inspired by the instrument’s role and function in Christianity.” Rather, she claims, “both religions independently developed an interest in the organ [before it] became an established instrument in Christian worship between 1100 and 1450” (18). After depicting meshorerim (synagogue choir boys) as the forerunners of organ accompaniment, Frühauf discusses the first attempts to reform Jewish liturgical music and to admit instruments in to the service in Prague and Venice during the 17th century. The use of the organ in these sites, she points out, produced some fascinating rabbinical responsa. Chapter three deals with the evolving liturgical reforms of the 19th and 20th centuries. Frühauf here discusses the introduction of musical aspects of the service “designed to appeal more to a public that was increasingly educated in Western art music” (28), and led to the “emancipation of the organ” which became a symbol of the division in modern Judaism between Orthodox and Reform. Against this background of arguments based on Jewish legal texts, Louis Lewandowski is presented as the first to advocate for the organ on the premise of new musical and acoustic demands (28-35). Indeed, Lewandowski’s vision gave birth to the instrument’s double role in the synagogue as both accompanist and solo instrument. A similar role was recognized by Salomon Sulzer, who influenced the Augsburg Jewish Synod’s decision in 1871 to permit non-Jews and Jews to officially play the organ on Sabbath and holy days. After briefly summarizing the dissemination of organs into Sephardic synagogues, and their destruction in the Kristallnacht, the author then starts anew: dealing with the history of organ building, which, in “the synagogue never followed its own independent path” (49); and she details the many “visual adaptations” that involved the organ’s location, design, and iconography. The intermezzo chapter discloses another inversion—the criteria Jewish congregations established for including or excluding non-Jewish organists in the synagogue—and discusses the way non-Jews as a result were “establishing a relationship with Jewish Kultus [roughly, ritual]” (91). The fact that there were very few trained Jewish organists until the late 19th century meant that positions were manned by Christian instrumentalists, who introduced general Western art music repertoire to the synagogue as its liturgy was westernizing. 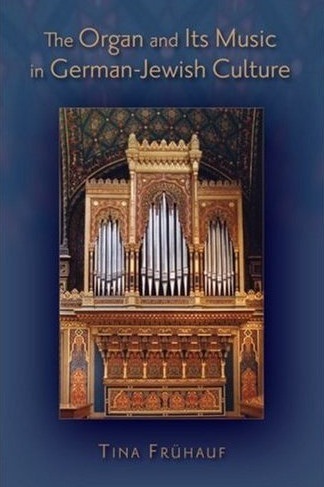 Chapter four, the largest section of the book, elaborates on the different stages of synagogue organ repertoire, focusing on both functional works and compositions based on Jewish themes. Whereas early books of organ music for Jewish worship are characterized by their “simplicity and proximity to Christian models” (110), emancipation in synagogue music, according to the author, began when cantors began using their modest compositional skills. Frühauf lucidly analyzes works by Moritz Deutsch and Louis Lewandowski as part of the interim stages of synagogue organ music composition, which was still under the influence of Christian models. We learn of important public expressions of synagogue organ music, such as the organ concert at Dortmund synagogue in 1904 “for the benefit of the German troops in South West Africa,” and similar events that included Richard Wagner’s compositions (133), which may be seen as apologetic given the latter’s infamous impressions of synagogue music. Frühauf then explores the subsequent development of synagogue organ composition through analyses of compositions by Herbert Fromm, Heinrich Schalit, Hans Samuel, Arno Nadel, and Siegfried Würzburger. These composers, Frühauf notes, used techniques ranging from quotations from Idelsohn’s Thesaurus of Hebrew-Oriental Melodies to the use of Sprechgesang in attempts to clothe their works with “Eastern” (here read as authentic) musical properties. Chapter five summarizes the dissemination of that tradition to the United States and Israel following the Nazis’ rise to power. Whereas in the United States this German-Jewish tradition did not thrive beyond the emigrants that imported it, in Israel it assimilated into the margins of local contemporary art music. Here we get a rare first-of-its-kind discussion of Israeli art music for organ by Paul Ben-Haim, Haim Alexander, and Hans Samuel. The book’s merits are also its deficiencies. It deals with many topics that are not only difficult to summarize here, but which also form a mosaic of discourses that ultimately amounts to less than the sum of its parts. Frühauf’s pioneering research maintains a safe distance from the published and unpublished sentimental memoirs of Jewish organists. Yet the adoption of the organ into the synagogue, and the repertoire it stimulated, go beyond what the author asserts in chapter six as simply “another ‘successful’ step towards assimilation,” and “the search for a new identity that lay somewhere between the Christian model of the choral prelude and the [Western] use of Jewish melodies” (215). The organ’s introduction into the synagogue embodies an aesthetic reaction to noisy sonic images that had accumulated from the 16th century (at least) in both music and writings about Jews: from Orazio Vecchi’s staging of noisy and unmusical Hebrews in his L’Amfiparnaso (1597), through parts of Rabbi Leon Modena’s introduction in Salamone Rossi’s Hashirim Asher Lishelomo (1622-3) attesting to such images, to Wagner’s portrayal of cacophonous synagogue music reflected even in his onomatopoeic text (Gegurgel, Gejodel, and Geplapper). Indeed, Frühauf brings some important ideas that show Jews’ awareness of such problematic sonic images: Benedict Levi demands aesthetic improvements of the Liturgy (32); Sulzer talks about the value of group singing with musical direction, and the concealing of dissonances so a “good many evils” might be avoided (41); and Josef Singer praises Moritz Deutsch’s organ works, as he complains about the masses’ “impertinent judgment on those who strive for and create art” (119). All of these descriptions certainly argue with Wagnerian accusations. Due to the importance of the words that describe sound, it seems that the many tractates and rabbinical responsa discussed by Frühauf should have been quoted directly rather than summarized. Since Jewish music lags behind Christian musical literacy and its traditions, we need to extract sonic images from texts that concern Jewish music in order to understand the way Jews and their music were perceived by both Jews and non Jews (consider for example the Grimm Brothers’ story “The Jew in the Brambles”), and in turn, to understand the organ’s role in attempts to improve these usually negative images. Similarly, various positive characterizations of Jewish music from these responsa should have been compared with the phrasings of those who slander it, so we could better understand the discourse, its idioms and images (consider the musical allusion in George Eliot’s Daniel Deronda). The organ embodies a bow to unmusical prejudices about Jewish music in hope of dispelling them. Finally, analytical parts in the book are difficult to follow, since the reader is presented with very few musical examples. These examples, moreover, are all monophonic thematic excerpts that make it impossible to study composers’ perceptions of harmony, counterpoint, texture, and cultural “negotiation” (or lack thereof) between Jewish and non-Jewish realms. It is especially difficult to imagine those works for which Frühauf provides no musical examples, particularly when the author uses opaque descriptions in their stead; in one instance, Frühauf describes how Würzburger’s interludes “partially follow major or minor tonality, as Würzburger introduces the augmented second” (167). Without a musical example to support such an argument, besides a simplified skeleton of the Ahavah Rabbah Shtayger (mode), there is no way of telling to what extent such “partial” use may have influenced Würzburger’s tonal tools. Hans Samuel’s remarkable attempt to write instrumental, free rhythmic recitatives, meanwhile, lacks musical examples completely. Additionally, readers familiar with musicological literature by Pieter C. Ven der Toon, Richard Taruskin, Robert Morgan, and Arnold Whitthall will find the author’s use of the terms Gebrauchsmusik (138) and Neoclassicism (162) quite confusing, as she relies exclusively on Joseph Machlis’ Introduction to Contemporary Music from 1979 for her definitions. Perhaps a better way to deal with analysis of Western Jewish music, specifically art music, would be to analyze a composition’s moments of transformation before it reaches its final stage. By this I mean the comparison of several transcriptions of a given Jewish melody (so we could safely imagine a melodic prototype) on the one hand, and the discussion of non-Jewish musical idioms of the period on the other hand, from which we can learn how perceptions of Jewish music were articulated using the so-called “non-Jewish” toolbox. If we only analyze the final Western artifact, then we are forced to use Western harmonic terminology, which says little about the process of musical assimilation or dissimilation. Analyzing these moments of assimilation into the West may unfold a spectrum of Jewish apologetics in Eurocentric clothing, especially if we bring into play the words that formed the sonic discourse about Jewish music. Grafting such components on our methodological lens might also help clarify why the European basis of this German-Jewish tradition in the United States had been considered obsolete by the 1970s. Aside from the prioritization of decorum in American Reform synagogues that gradually popularized the Reform liturgy, all American emigrants discussed in the book were completely detached from the discourse of American modern music and its idioms, and thereby forced to stay in Reform synagogues as the last representatives of a dying tradition. James Loeffler, The Most Musical Nation: Jews and Culture in the Late Russian Empire (New Haven: Yale University Press, 2010); Klara Moricz, Jewish Identities: Nationalism, Racism, and Utopianism in Twentieth-Century Music (Berkeley: University of California Press, 2008); David Schiller, Bloch, Schoenberg, and Bernstein: Assimilating Jewish Music (Oxford: Oxford University Press, 2003); Barry Seldes, Leonard Bernstein: The Political Life of an American Musician (Berkeley: University of California Press, 2009). Don Harrán, “’Barucaba’ as an Emblem for Jewishness in Early Italian Art Music,” Jewish Quarterly Review 98/3 (2008): 328-354. See also: Idem, “Between Exclusion and Inclusion: Jews as Portrayed in Italian Music from the Late Fifteenth to the Early Seventeenth Centuries,” in Acculturation and its Discontents: the Italian Jewish Experience between Exclusion and Inclusion, eds. David H. Myers et al. (Toronto: University of Toronto Press, 2008), 72-98. “No more / will bitter words / about the Hebrew people be uttered, / in a voice of scorn, / by the haughty.” See Don Harrán, ed., Salamone Rossi: Complete Works (Middleton WI: American Institute of Musicology, 2003), vol. 13a, 190. Ruth HaCohen, “Between Noise and Harmony: The Oratorical Moment in the Musical Entanglements of Jews and Christians,” Critical Inquiry 32/2 (2006): 258.